Harrison's Talent Acquisition solution enables you to hire the right talent - and do it quickly. Filter and rank the best candidates before you review resumes or interview. Quickly identify, interview, attract, and hire the best candidates using predictive analytics. Our award-winning recruitment technology pre-screens applicants for qualifications and job specific behaviour providing actionable data for effective decisions. Our recruitment technology eliminates the need to review resumes (aside from the final candidates) and saves more than 70% of administration time by automatically ranking applicants according to how well they meet your ideal requirements. Integrated applicant tracking features enable easy resume review, shortlisting and auto-decline responses. The best candidates usually have multiple competing offers and may not wait for you to complete your short-listing process. Harrison solves this problem by enabling you to discover the best candidates within minutes of an application being completed. The Harrison system provides a world-class candidate experience and technology that shortens assessments and maximizes useful data. By assessing mutual needs, the Harrison enables you to establish a long-term mutually beneficial employment relationship. Our How to Attract Report shows you the key factors to emphasize to convince top talent to accept your employment offer. Our recruitment technology saves 70% or more of recruitment time allowing for campaigns to be completed in a fraction of the time. It enables you to very inexpensively screen for qualifications before paying for any other assessments. Unlike other assessments that charge for sending the questionnaire, Harrison only charges for generating reports. and the results of our SmartQuestionnaire can be further used for a wide range of employee development functions after hiring. Our JobFlix monthly subscription option provides unlimited applicant screening, fully customized assessment by our experts, and a free Your Greatest Strengths Report with your branding for every applicant upon completion of the questionnaire. Our Annual Assessment Agreements (AAA) provide unlimited screening, complementary Your Greatest Strengths Reports for every applicant, and development and behavioural competency reports for every employee - All for a low yearly cost based on employee numbers. General personality tests measure only 4-20 personality factors and can help employees become more sensitive to others with different behavioural styles. However, to effectively predict job success, assessment needs to be comprehensive and job specific. The Harrison SmartQuestionnaire measures 175 behavioural factors that include personality, attitude, motivation, work values, interpersonal skills, engagement factors, retention factors, and behavioural competencies. Each assessment is customized to be job specific and supported with 30+ years of job performance research. 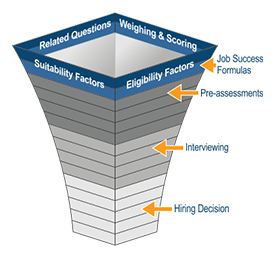 Our assessments comply with EEOC regulations as well as ISO 10667. Our Benchmarking Analytics option provides job specific research and scientific validation for your specific custom criteria.